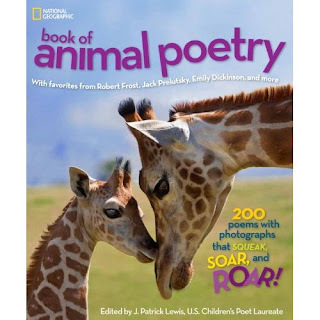 I'm proud to be apart of J. Patrick Lewis's new book: National Geographic Book of Animal Poetry: 200 Poems with Photographs That Squeak, Soar, and Roar!, due out in mid-September. To say "I'm in good company" is an understatement, as Benjamin Franklin, Robert Frost, Emily Dickinson, Rudyard Kipling, and Robert Louis Stevenson are just some of the poets in this visually stunning book illustrated with photographs from the National Geographic archives. Contemporary poets include Jack Prelutsky, Joyce Sidman, Leadbelly, and J. Patrick Lewis. Kirkus Reviews has already given it a starred review! Congrats! Sounds like it's a fabulous anthology! Thanx Vikram. I can hardly wait to get my copy.